It seems things are finally going right for Paul Kersey (Bronson). Far from his past troubles, he’s now in the witness protection program, assuming the pseudonym Paul Stuart and the role of architecture professor. He’s engaged to the lovely and successful fashion designer Olivia Regent (Down), and enjoys a great relationship with her young daughter Chelsea (Fairfield). But, once again, problems arise as super-evil gangster Tommy O’Shea (Parks) and his gang of thugs want control of the fashion house, and, oddly, Tommy is Chelsea’s father and wants to take her away. After several events push him to the breaking point, Kersey dispenses his own brand of justice on the bad guys. Judging by his relationship with Lesley-Anne Down, Paul Kersey’s still “got it”, even at his advanced age. Because the movie is a series of murders surrounding a fashion house, it is reminiscent of the Mario Bava classic Blood and Black Lace (1964). Interestingly, neither in the opening credits or the movie’s trailer is the number five or “V” shown. 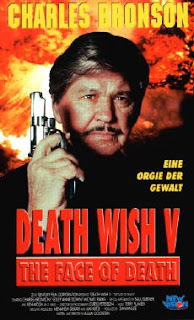 It simply says “Death Wish: The Face of Death”. The filmmakers were clearly trying to distance themselves from the fact this series, like the aforementioned Bronson, is also reaching an advanced age. Possibly because of this, the filmmakers were forced to make the deaths more creative, so it’s not just shooting all the time. Paul Kersey actually wields that most sinister of all instruments of death: a remote-control exploding soccer ball. Because of this, Kersey’s antics are more reminiscent of Kevin’s injury (or perhaps death)-inducing “pranks” in the Home Alone series. Luckily, however, the movie has a really good pace and is entertaining, so it goes by in a flash. Helping that is Michael Parks as O’Shea, who resembles Adam West, and his goons, such as Chicki (Lund) and all the other baddies who all let out silly yells during the action scenes. Adding to the silly factor, besides some of the deaths and yelling, is the fact that it is Canada masquerading as New York. It was trying for low key, but some of the more ridiculous deaths go against that. We noticed some abrupt cutting during some of the death scenes - we’re not sure, but there is a chance the U.S. DVD is cut. So, despite some of its sillier elements, Death Wish V: The Face of Death is actually a briskly-paced movie with some pleasantly-familiar faces, and of course it has a strong pro-revenge philosophy behind it. It’s good stuff, especially if you’re in a mood that is leaning towards the more cartoonish side of things. Also check out our buddy, Direct To Video Connoisseur's review! You know, I own the entire Death Wish series but I haven't yet watched them all. Just the first and third. Everytime I look at them I want to just watch all 5 of them back to back. I know that'll never happen so I should just watch them and be done with it because I've heard nothing but good thing about them. Thank you for this review. I love this one. It doesn't quite match the insanity of Part 3 but some of the deaths are so ridiculous (like the soccer ball) that you have to love it. I saw this in the theater the day it came out and I'm glad I did. It's one of my favorite moviegoing memories of the 90's. Great review, keep 'em coming! Mr. Gable: Your welcome, buddy! Definitely interested in your opinion on 4 and 5. But the 3rd Death wish can't be beat for the sheer silliness and high body count! Video Vacuum: Thanks! That is so cool you saw this in the theater. That must have been a blast. Also love some of the deaths in this too. The soccer ball one is original. I enjoyed this one for the most part but felt that apart from the creative kills, it was just more of the same. Still, it's certainly a fun way to kill 90 minutes. Totally agree with you. When you get to a part 5, you definitely start to run out of ideas. But overall, you're right, this is a good time killer. If Bronson didn't die, maybe he could have made another one! Haha. I really like this one! not as good as the first 3 ones but it beats the 4th by miles! Totally agree. The fourth one, while still really silly, was not as good as the 3rd and 5th. I enjoyed this back in the day, not sure I would now though. It doesn't exactly hold up, but it is still fun. 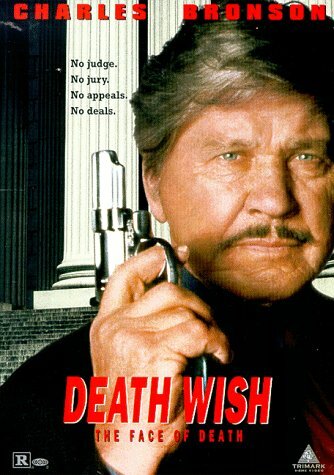 Man, you know believe it or not, I don't think I've ever seen any of the Death Wish films. Blaspheme, I know. I'll have to fix that one day. I keep hearing how part 3 can't be beat, but I'll need to see them in chronological order, just for continuity's sake. Great review guys. And I'm actually surprised, after 5 I would assume that the series would have gotten stale, but that doesn't seem to be the case here, which is always a good sign. I also love how Bronson looks exactly the same doing the same pose for all 3 images you provided for this post. lol. Classic. 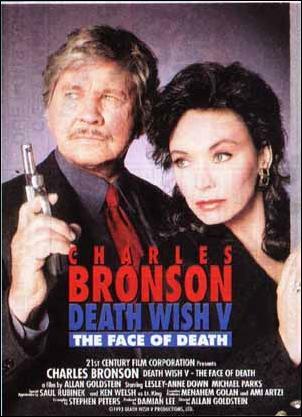 Don't feel bad about not having seen the Death Wish series. They are five (!) of them after all and it can be daunting! However, it is worth it, we think. Charles Bronson only had one facial expression (which is usually complete indifference...) but it is a winner, so he stuck with it and we're all reaping the rewards to this day! Cannon Films managed to take things up a notch!Don't forget that after it bought the rights,the movies after the fist one where shot during the Reagan administration...Extreme Violence was the norm and extreme prejudice as well!Check out what i've writen about the first one..there's an interesting book about all Death Wish movies..try to find it..it's very informative and interesting! But yes number 5 man!This is the one where he kills a guy with a deadly rigatoni?! !Ihaven't seen them in a while!But you know what goes...so many movies,so little time!Keep up the good work my friend! We have heard of the book but have yet to read it. Thanks! And don't forget about the killer soccer ball! Hey, thanks for the plug! This was my least favorite of the series, but it's funny, least favorite makes it pretty close to your three-star review in my book. No problem, buddy! This definitely had its moments, but Bronson looked pretty tired in this. Michael Parks put in a good performance as the villain though. I have to disagree with those saying V is better than IV. 'The Crackdown' featured some classic death scenes, especially Bronson wasting those goons in the fish factory, the Mafia in the restaurant, the drug dealers in the video store and blowing John P. Ryan away with the grenade launcher. This never comes close to reaching those ludicrous heights. Of course 3 is the undisputed champion and I even wrote a review of it on here a few months back. That said DWII is close behind, the gartuitous violence at an all time high. V however seems almost like the recently reviewed 'American Ninja V,' watered down and missing the magic of the earlier films. Somehow these films were quintessentially 80's and didn't translate as well to the 90's. I own part V but I haven't watched it in years. That's reserved for II, III and IV. The first DW is actually a serious film which makes it almost not part of the series. Everyone has their own opinion on the Death Wish series. We definitely agree that the 1st one is so good and it doesn't seem to fit in with the rest of the sequels! We will review Death Wish 4 in 2012.